Why Swim Spas are becoming more Popular than Ever! Are you looking to add some fun to your backyard swim sessions in the pool? In this post, we take a look at some accessories that will add some sparkle and fun into pool time play sessions. After all, it’s the little things that make life interesting. This is one for the kids or the young at heart. It’s an inflatable Jeep, so you can cruise around your pool in style. The best part is that you can put your lips just above the water and make those gurgling noises for sound effects. Brrrrrrrrp. Weeeeeeeeeeeeeeeeeeeee. Diving straight in the pool is so yesterday. If you want to enter in style, why not slide your way through twist and turns with a granite slide made by the people at S.R Smith? 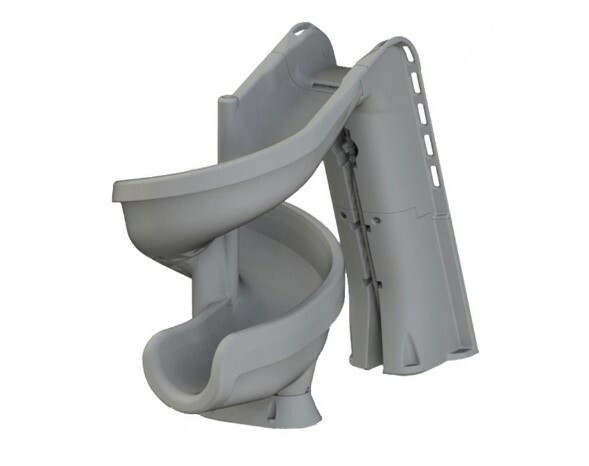 The Helix slide will bring out your inner child as you scream out to whoever is watching “Watch me, watch me!” After the onlooker reluctantly accepts your invitation you can show off your sliding prowess. Ideal for the inground pool, or any pool for that matter, these larger than life blow up peacocks will see you sailing the high seas of your backyard pool in style and grace. They are big enough to fit 4 children or 2 adults. Gone are the days of swanning around looking pretty. It’s all about peacocking. Baton down the hatches, report to the galley, it’s time for some swashbuckling action. 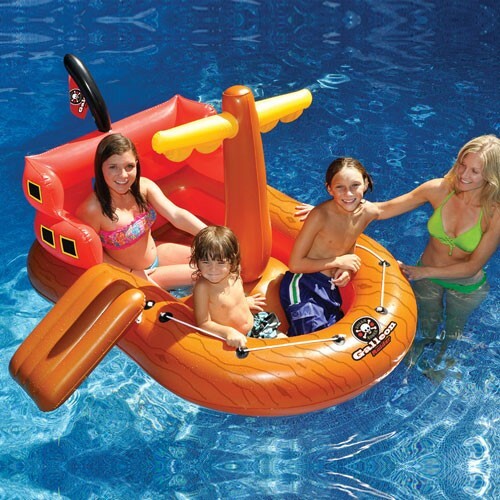 This inflatable pirate ship will transport you to the high seas, as you set the sail at full mast and start pillaging in the safe confines of your backyard pool. If one of your ship mates is a scurvy land lubber, make him walk the plank. Ok we know we said the swan was a thing of the past. 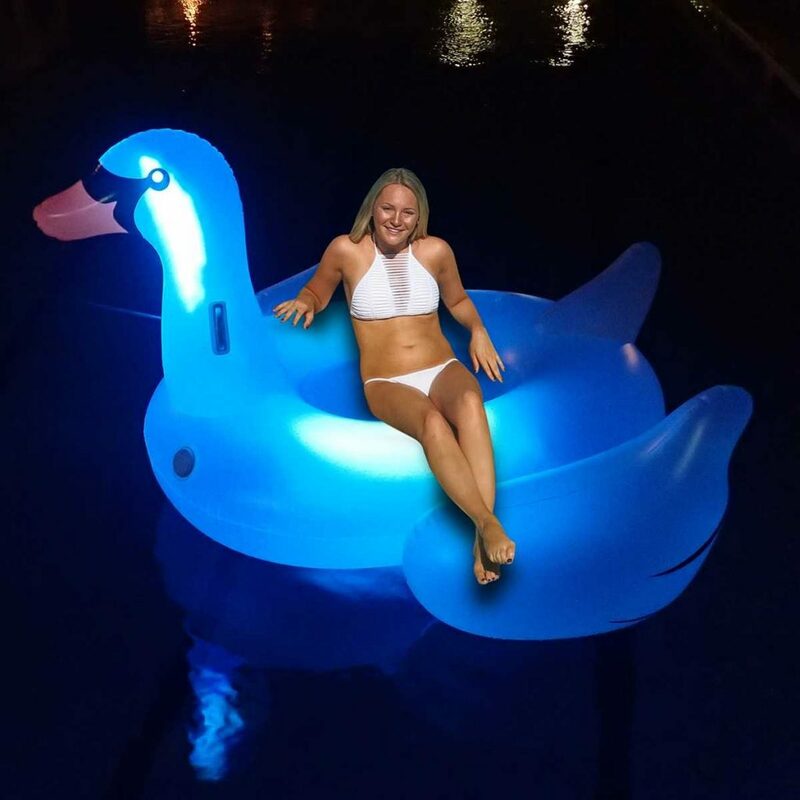 But a LED light up swan is the pool accessory of the future. It’s similar to other blow up swans, but wait for it, wait for it…It has led lights, so you swan around like an illuminated crazy bird. An island in the sun is something we all dream about, that tropical oasis with palm trees and coconuts and a ball named Wilson. 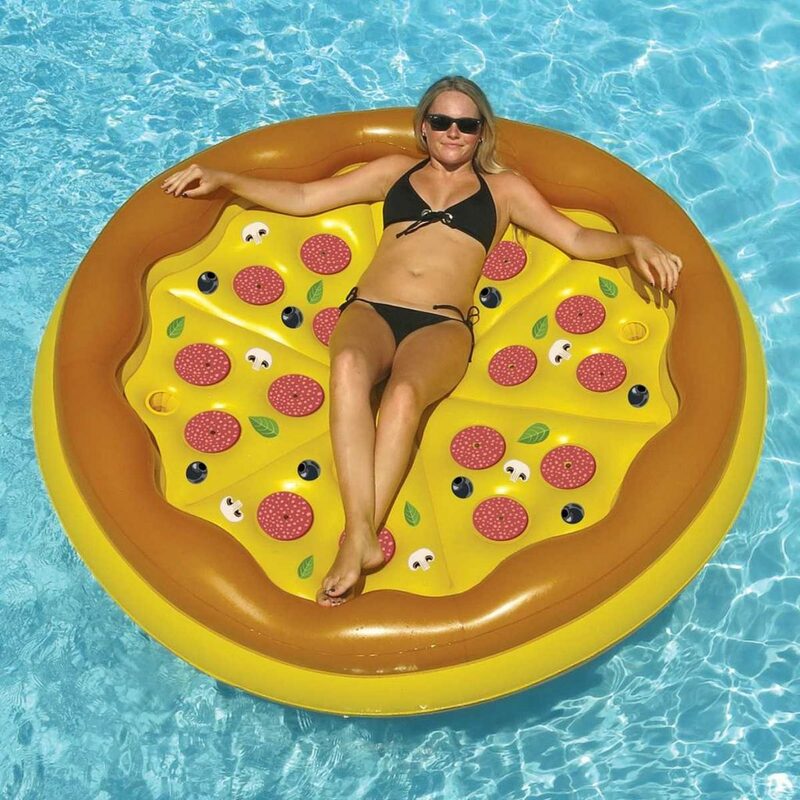 Well, Swimline has taken it one step further and made a personal pizza island. It comes in a complete pizza, or if you don’t think you finish the whole thing, you can get just a slice. A slice of floating heaven. Checkers and chess are very gruelling games that require you to exert immense physical and let’s face it, it’s way too hot to play in the summer. So why not take it to the pool and keep cool. This curly whirly inflatable toy is from Swimline. It comes with no instructions, so any practical application will be up to the user’s imagination. It’s ambiguous yet fun. This summer get wet, get silly and get some inflatables to add some sparkle and whimsy while you stay cool in the pool. And for all your other pool needs, contact us, the experts at Blue Haven Pools.